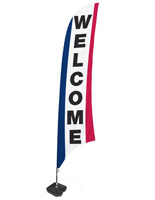 These welcome flags are the ideal way to draw customers and guests into your store or business! 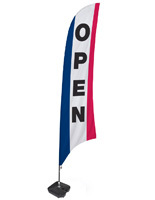 The 13' tall banners can be seen from quite a distance away, letting people know that you are open! 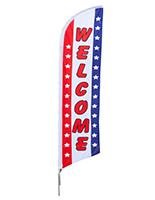 The red, white and blue flags are made from durable polyester that is weather resistant. However, the banners are not designed to be used in winds over 20 mph. The flags come with a base spike that can be achored into the grass or dirt. 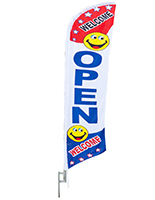 Greet customers with this custom banner and increase your sales today!